According to THR Charlie Bean, who directed The Lego Ninjago Movie, is going to the dogs. Bean has closed a deal to helm the live-action/CG hybrid remake of Disney’s animated classic Lady and the Tramp. The service will have four to six movies a year among content that will include film and TV offerings from Disney brands Pixar, Marvel and Star Wars. 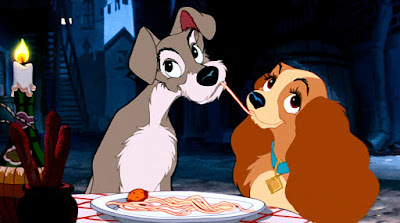 Lady and the Tramp, released in 1955, told the love story between a pampered Cocker Spaniel named Lady and a streetwise mongrel named Tramp. Lady finds herself out on the street after her owners have a baby and is saved from a pack by Tramp, who tries to show her how to live her life footloose and collar-free. More doggone adventures ensue. The centerpiece of the movie is the candlelit spaghetti dinner in an alley while two human cooks sing and play "Bella Notte," considered one of the most iconic scenes in Disney and movie history. Andrew Bujalski penned the script for the remake. Jessica Virtue and Chaz Salembier are overseeing for Disney. Bean is a longtime animator who has written on Dexter’s Laboratory and Samurai Jack and directed 18 out of the 19 episodes of Disney XD’s Tron: Uprising before making his feature debut with Ninjago. Lady and the Tramp now trampolines the helmer into the live-action world while still keeping him tethered to animation.